The acronym HDR stands for High Dynamic Range. The term can refer to a computer program, or a photograph that has been processed by an HDR program, or the technique of taking multiple photographs with the intention of blending them together in an HDR program. Let’s begin with the phrase “dynamic range.” Dynamic range refers to the amount of separation between the brightest and darkest parts of a scene. A scene low in dynamic range has a limited range of brightness tones (as seen below). Example of a low dynamic range photo, from Death Valley National Park. Example of a high dynamic range photo., of Moraine Lake in Canada'a Banff National Park. The problem, of course, is that even the best cameras cannot capture a scene with an extreme amount of dynamic range. In the example of the Moraine Lake photo, to reveal the detail in all of the tones, I made five different exposures of the scene by using different shutter speeds (1/125, 1/60, 1/30, 1/15 and 1/8—all at f/11) and blended them together in an HDR program called PhotoMatix. Final image created by blending five different exposures. While HDR is a common technique in daytime photography, the definition of high contrast certainly describes many nighttime scenarios. Not all night scenes are high in contrast, though. A landscape illuminated by a full moon, for example, can be fairly low in dynamic range. Low-contrast scene illuminated by the full moon, in Zion National Park. But any scene that contains deep shadows and very bright highlights is a candidate for the HDR process—even if it's after dark. This scenario is especially common at night when we mix deep shadows and man-made light sources, such as city lights or car trails. High-contrast scene mixing Las Vegas city lights and deep shadows. Below is a final image I made in Las Vegas after shooting three separate exposures of 1 second, 2 seconds and 4 seconds (all at f/11) and blending them together in PhotoMatix. This process reveals details in the dark shadows while allowing the city lights to retain texture while remaining bright. Final image after HDR treatment. I don’t use the HDR process for every nighttime image, but when confronted with deep shadows, bright city lights or brightly lit buildings, I’ll certainly consider it. This is exactly what happened to me while scouting and shooting for our upcoming night photography adventure workshop in Cuyahoga Valley National Park. I wanted to take a picture of the rail crossing and station at Boston Mill. In order to capture detail in the "Boston Mill" sign on the depot, I had to use an exposure of 8 seconds, f/8 at ISO 100. 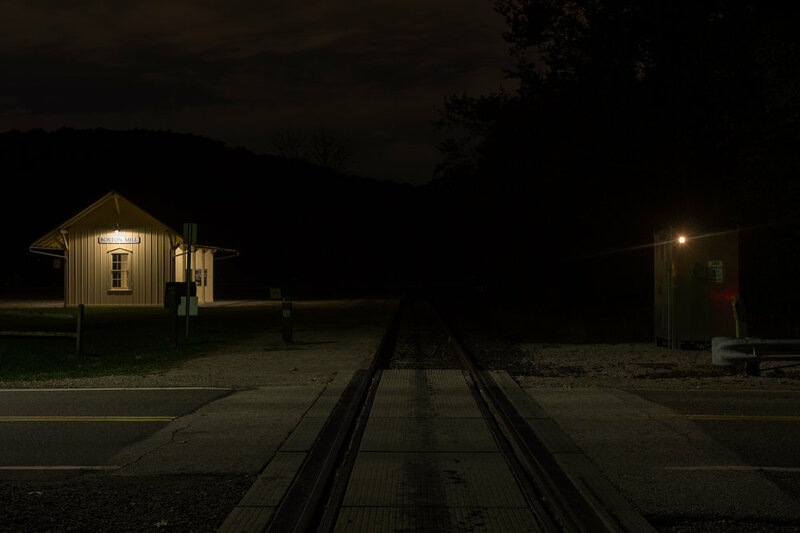 At Cuyahoga Valley, an exposure of 8 seconds, f/8 at ISO 100 recorded detail in the highlights. However, this exposure left the sky and foreground very dark. Therefore, it was time for HDR. I needed to create a few more exposures that were brighter so I could get some detail in the darker areas of the image. Varying only the shutter speed to alter exposures left my f-stop constant, which in turn created the same amount of depth of field in each image. Exposures of 15 seconds at f/8, 30 seconds at f/8, and 1 minute at f/8. After viewing the histogram of the 1-minute exposure, I decided that the shadows had received enough light, and I didn’t need to open them up any more. Later, I took all four exposures and blended them together in PhotoMatix. HDR blend of the four exposures. Blending the images together kept the highlight detail of the Boston Mill sign intact while brightening up the shadow portions of the image. At this point I had all the exposures necessary to reveal the desired detail, but I had not captured the car trails that I was hoping for. Leaving my camera in position, I waited for more traffic and made a few more exposures. To create the final image (below), I used Photoshop to add a few more exposures with car trails to the HDR blended image above. The final image of the HDR frame (four exposures combined) layered with car-trail exposures. When making images at night, we’re faced with all sorts of challenges. In the case of the Boston Mill shot, the difficulty lay in the extreme contrast between the lit sign, the dark foreground and even darker sky. By taking multiple exposures and blending them together in HDR I was able to control that high contrast. Like with any photography discipline, a firm grasp of the basics and being familiar with your gear will carry you through many situations. Knowing a few cool techniques like HDR, however, can greatly expand the possibilities. For more information about shooting and processing HDR images, check out Tim Cooper’s books The Realistic HDR Image and HDR Photography: From Snapshots to Great Shots. If you are interested in using Tim’s HDR program of choice, click for a 15% discount on PhotoMatix.